Audio – HDMI, 3.5 mm jack for headphone or S/PDIF? USB – 2x USB 2.0 host ports, 1x USB 3.0 port. 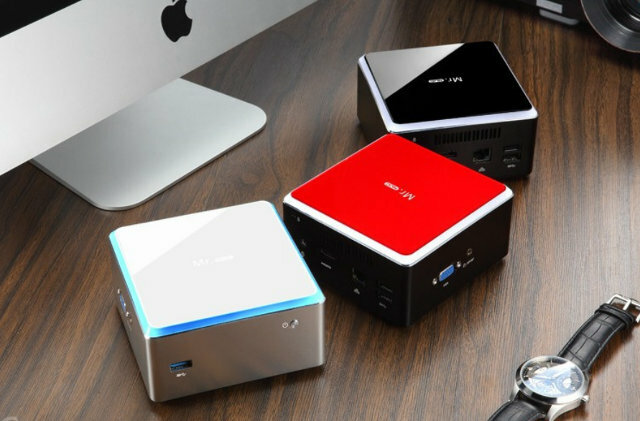 The mini PC comes with a power adapter and cord, a VESA mount with screws, an installation manual, and a warranty card. 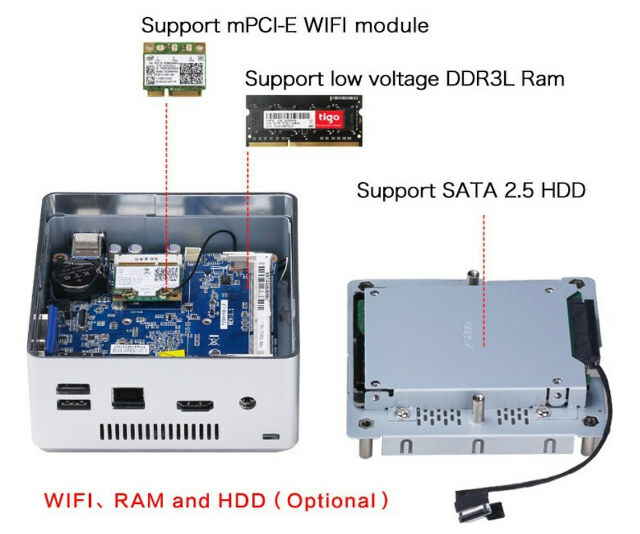 Shenzhen Realan does not sell complete kits with Wi-Fi , RAM and hard drive, so you’d also have to purchase an Intel NUC compatible wireless module, a 2.5″ hard drive or SSD, as well as a SO-DIMM DDR3L module to have a fully functional computer. You’d also need to install your preferred operating system be it Windows or a Linux distribution by yourself. Some other alternatives like CSQ CSW9, X29-J1900, or even an original Intel NUC might be a better deal depending on where you live. You can also check out the manufacturer’s page. which also claims support for an extra mSATA SSD just line in an Intel NUC. I’ve never figured out why the list it with DHL almost overnight, vs Chinese Post, which is probably reasonable. Maybe customs clearing? Not sure. However I’d try to get it changed to some shipping method more reasonable if I could. thanks, nice review as always. It costs more — so they can ship it regular post and pocket the difference. A HP Stream/Pavilion Mini will be more cost efficient. Some Chromeboxes (Asus, HP, etc.) have similar spec’s as well as prices too. @jim. From my experience the chinese or singapore post services are shocking. DElivery to Australia, which is in teh same asia pac region takes 2 -4 weeks and frequently gets lost. For larger of heavier items they can’t use the regular post. The limit is somewhere around 2KG. It’s not that they don’t want to offer cheaper shipping, there’s competition between sellers so someone would offer the cheaper shipping if it were possible. Btw the Chinese don’t even ship these themselves, they just send them to some “logistics center” and that takes care of all the shipping so it’s not even up to them most of the time. Customs brokerage indeed I guess. I have nothing but praise for DHL Belgium when it comes to customer service, but believe me, you don’t want to deal with the greedy incompetent bureaucrats at DHL Latvia. DHL Belgium reliably gets me packages from China in 3-4 days. Brokerage fee under 25€ (excluding import VAT and import taxes of course). Delivered to my doorstep without any interaction from me needed. * wait for an invoice from DHL Latvia for this exact shipment’s customs brokerage. I can’t pay anything before the shipment gets cleared to speed up the process. I can’t pay anything on delivery after the goods have gone through customs. This means my Chinese imports usually get to DHL’s Latvian customs warehouse in about 4 days. Then it’s stuck there for a day or two until they send me a customs brokerage invoice. If I make an express payment to their bank account, email them a copy of the statement and call them, it might get processed for delivery the next working day. Quite frustrating for a fscking 50$ ARM board. So for small shipments I either have it sent to my native Belgium by DHL, or I have it sent through China post. Oh well, at least it seems to arrive reliably. A little bit too similar to the Gigabyte BRIX BXBX-1900? Should be good to make a HTPC as it has a dvd-drive also. Altough it’s a little long wit 25cm (due to the dvd-drive). Yo Dude, if you want ads on your site that’s fine but don’t blame adblockers, people that don’t want to see your spy ads! If you want to show some ads, use your own site to show ads without an ad-network. It’s possible but don’t blame any visitor that doesn’t like these ad-networks. I don’t blame anybody. I just put a banner showing what can be done to support the site (and that does not include disabling Adblock). I’m also using my own ads, but they’ll be blocked after a while, once somebody decides to add them to Adblock list.